GPI A1 Commercial Grade Meters are packaged as a self-contained unit. Select this meter when you need an accurate, basic meter. 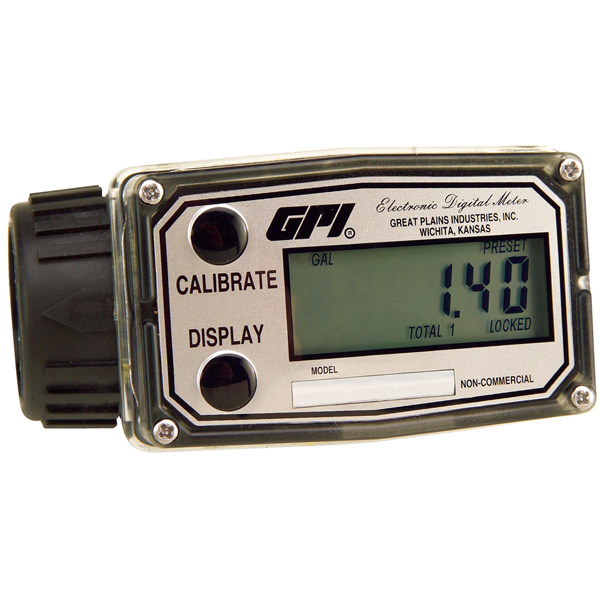 GPI Commercial Grade Meters come in Aluminium and Nylon. Choose one of three sizes of Aluminium meters for petroleum products. Use the Nylon meters for water or non-aggressive chemicals. The aluminium or nylon meters have a flow range from 1 – 11 lt/min and 11 – 190 lt/min with the large 2″ diameter in aluminium having a range from 114 – 1135 lt/min. A conditioned signal output module is available for communication with most remote process control devices and a remote kit for the LCD is also available to accommodate fluid temperatures from -40°C to +121°C.